Sen. Harry Reid announced today he's postponing the PIPA vote due to recent events. House Judiciary Committee Chairman Lamar Smith said he is putting the SOPA vote on hold. "There is no reason that the legitimate issues raised by many about this bill cannot be resolved." Several Senators and Congresspersons have come out in opposition to SOPA and PIPA today including PIPA co-sponsor Marc Rubio. Mozilla will be dark during the day. 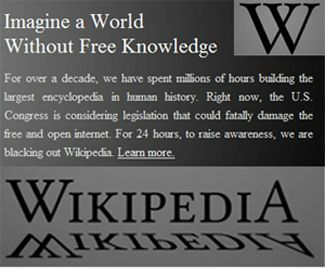 Wikipedia will go dark tomorrow on the day of protest against SOPA. Google will place a protest link on its home page. “We oppose these bills because there are smart, targeted ways to shut down foreign rogue websites without asking American companies to censor the Internet,” Samantha Smith, a Google spokeswoman, said in an e-mail today.